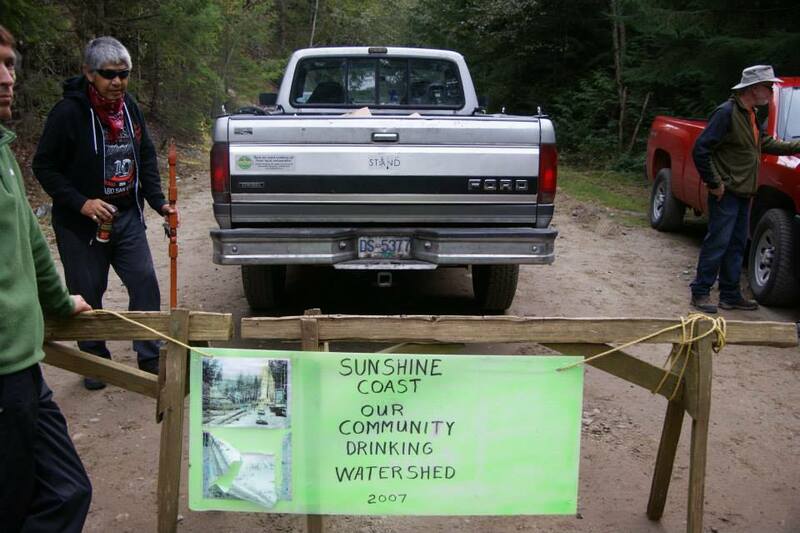 On Monday, October 6th, 2014 ELF was shocked to discover active logging in the Chapman Creek Community Drinking Watershed on the Sunshine Coast. Hans Penner of ELF was doing a routine check on the roads, when he noticed a new hauling road on the east side of the watershed. He then looked across Chapman Creek and saw a fresh cutblock not too far above the creek itself and approx. 1Km above the water intake. 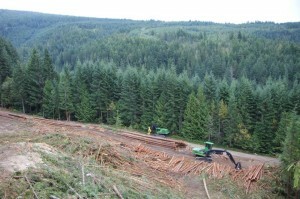 Next day a road block was organized at 5:30AM and was successful in stopping logging and hauling. 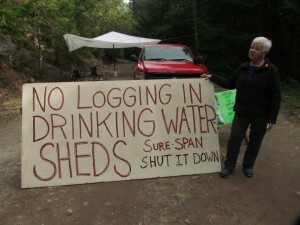 The 2nd blockage went up Wednesday at 5AM, and again turned back contractors. ELF asked concerned citizens to join this peaceful protest on Thursday and Friday 10th. 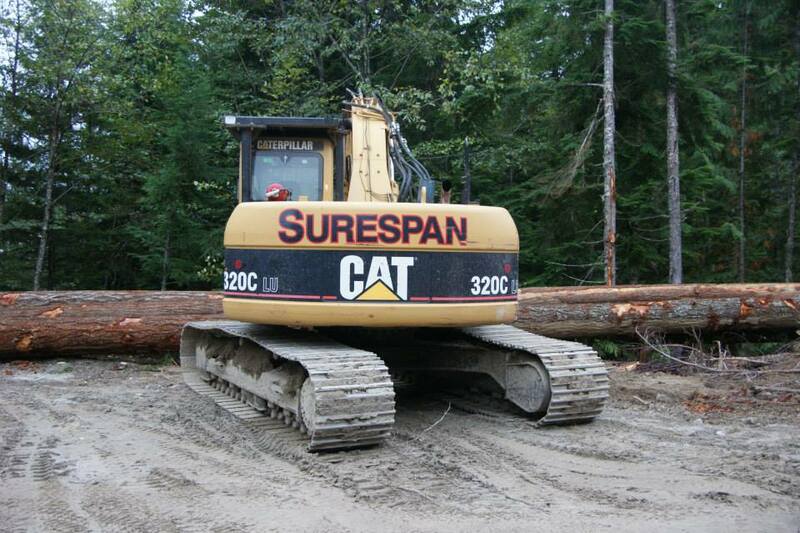 The ELF Roadblock is coming down this afternoon – as Surespan (the logging company) has agreed to pull out all equipment and not to log their Chapman Creek (east side) cutblock for the time being – even though they may look at it again Spring 2015. Small victory, even though many trees came down. Surespan Manager stated that about 10,000 m3 will stay in the ground. He said that “we’re not trying to be jerks about this.” However, the fact of the matter is that they logged in a community drinking watershed without informing the local water purveyor (Sunshine Coast Regional District). 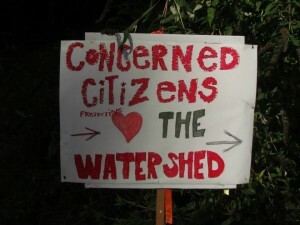 Big thanks should go out to Hans Penner (Roberts Creek) for getting this deal to happen, as he was the watershed watch guy and activist on this campaign. Hans Penner said it appeared most of the tree falling had been completed on the west side of the creek, but a major concern was that the east side — accessed off Field Road — would be next. 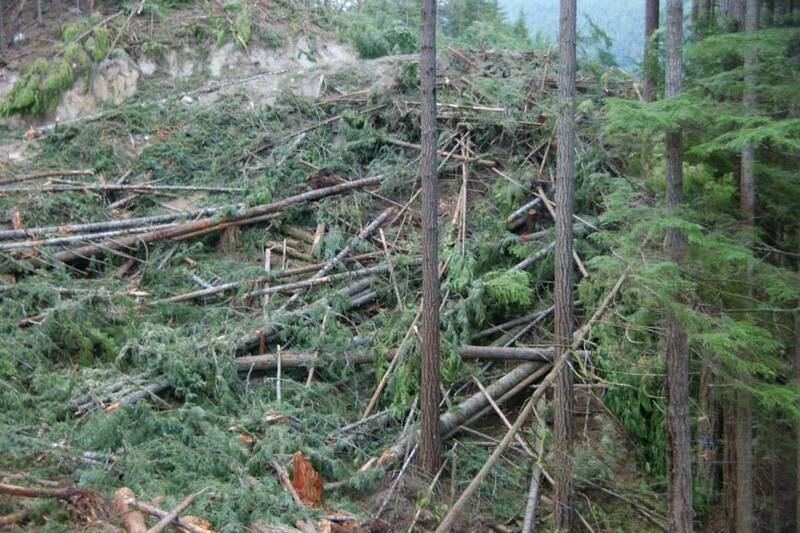 Jim Reeve commented – Unfortunately, they have already caused a lot of damage to the hydrology of that area. 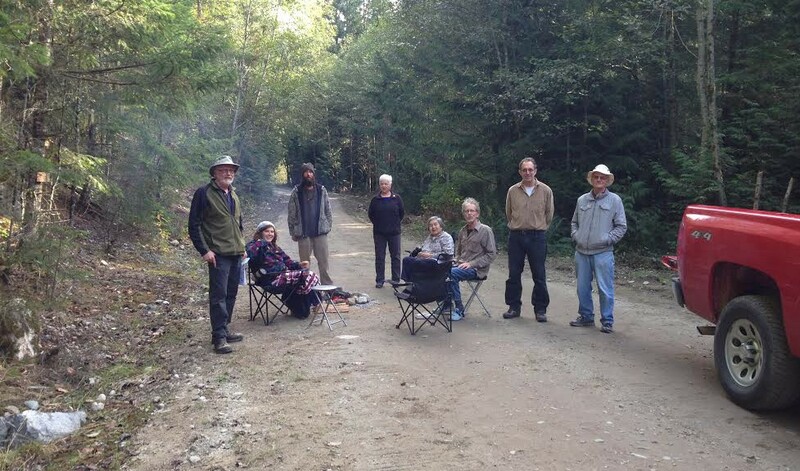 That area of land that has been disturbed by road building and logging, will DELIVER silt to Chapman Creek for many decades or a century, into the future. If you go there with a camera, try to predict where the silt will go down the ditches and natural water courses towards the creek. Take pictures of those water courses down hill from the cut block. A proper hydrologist should be interested in how many tons of silt will be delivered to the creek from this disturbed area. We could take this opportunity to show the fake “hydrologists” how they should be doing their job. ELF went on to comment, Surespan should be made to contract out 3rd party monitoring of this site. As Jim says this logged out area looks like a location for on-going sediment release. 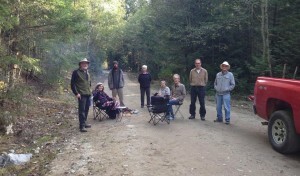 Hollyann Higgins commented – I believe every single person who came up the mountain deserves kudos. For giving up their time. For their help, for their belief in having the logging stopped at our watershed . Thank you all. My hands go up to you. ELF commented – When we work together across all communities we can gain ground back from the pillagers. Thanks to Barb, Holly-Anne and Willard from the Sechelt nation for coming out in support. 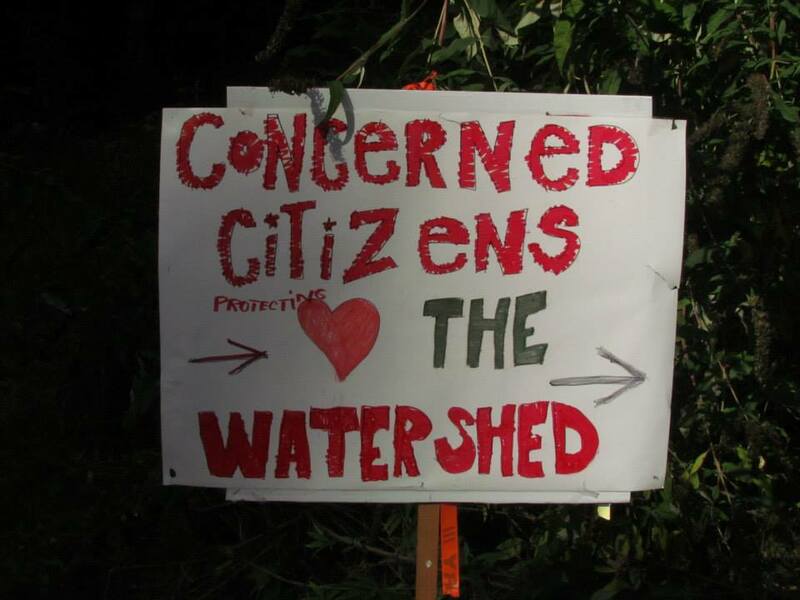 Take Action – Send an email to Surespan that you support the blockade to protect our watershed. 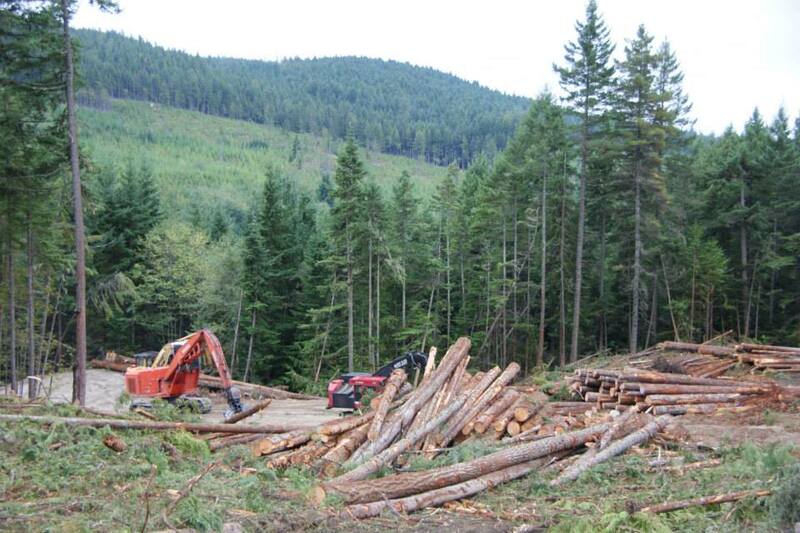 Sunshine Coast Regional District (SCRD) officials were scrambling for information this week after learning that extensive logging was taking place on private land in the lower portion of the Chapman Creek community watershed. 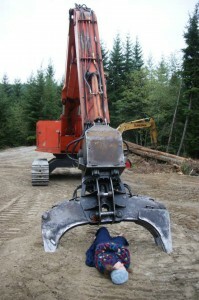 After informing the SCRD, Penner and a small group of activists returned the next two mornings and stopped the logging by setting up a blockade. “This was another no-logging day, so we’re happy with that,” Penner said Wednesday, after RCMP had paid a visit to the site and talked to the protesters. Though Penner vowed to return Thursday, he said he hoped the issue could be resolved by an emergency meeting between Sechelt First Nation and the SCRD. SCRD chair Garry Nohr said Wed-nes-day he had been unable to contact Sechelt Nation officials about the issue, but he did drive to the logging site and met with some of the protesters. “They felt there’s an injunction coming, and they’re probably right,” Nohr said. 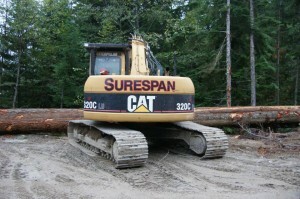 The SCRD was not informed of the activities, he said, because it does not have a protocol agreement with Surespan, as it does with BC Timber Sales and other operators. While the SCRD had not confirmed that Surespan was operating under the PMFL rules and regulations, “they told us they are and they have a professional forester who signs off on the papers, so I assume they are,” Nohr said. SCRD staff was preparing a report to present to the board at the Oct. 9 community services committee meeting as an emergency item. While staff were waiting on direction from the board, chief administrative officer John France said the report will recommend the SCRD monitor for turbidity above and below the logged area and also develop a protocol agreement with Surespan. 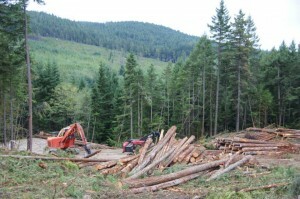 A board policy states the SCRD does not support logging in the community watershed. 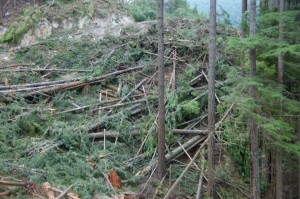 Penner said it appeared most of the tree falling had been completed on the west side of the creek, but a major concern was that the east side — accessed off Field Road — would be next. The company could not reached for comment.